Micromax mobiles have launched a new handset keeping in mind the taste and interest of music lovers of India at a very economical price of Rs.5000 only. 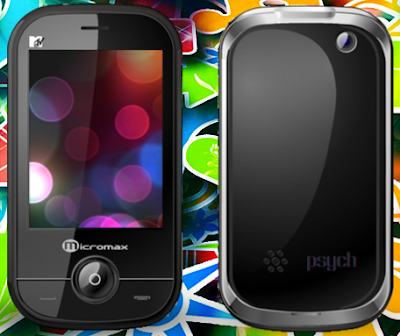 Referred to as Micromax X505 Psych music phone, this new handset is called so as it is preloaded with MTV content. This feature has been introduced in the phone in collaboration with music channel MTV. The phone is also Facebook ready and boasts of a 2.8 inch supercool touchscreen and to augment musical experience, there are Yamaha Audio Amplifiers.With built-in SRS WOW HD music technology and and multi format music player, Micromax X505 Psych phone is certainly a treat for all music lovers. 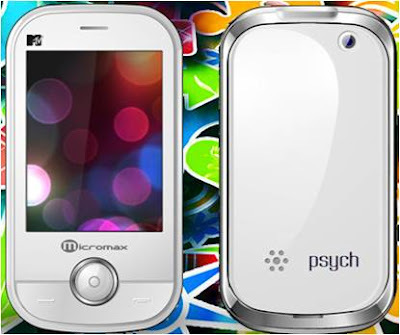 Micromax Psych is also equipped with 2 MP camera and is pre-loaded with multi-instant messenger “Nimbuzz” and social networking consortium Snaptu.In addition, the handset sports an array of additional features such as Opera mini browser, 3.5mm jack, stereo FM radio, video player and games. It comes with two psychadelic changeable backpanels.With this phone, buyers will rock on Diwali. It offers talk time up to 3 hours and standby time up to 5 days. nice phone in the micromax edition. It's a good mobile especially peoples for who want dual sim phones with touchscreen.Good music player with Yamaha amplifier.